The farm playset offered features such as a round, Gothic-style roof barn with dormer windows, large 4-wing barn door that actually opens and cut out windows on front and back wall. It also had a roomy feed conveyor that was quick and easy to set up. All you needed was a piece of string to fasten to a pole and side of the barn. It also came with extra large stanchions. The barn had a green roof. It was 16 1/4 inches long, 14 3/4 inches high to the top of the windmill. It ws beautifully colored in red and black and white trim, on a stone effect foundation. The back wall on the inside was decorated too. The ends and bottom were made of heavy wood and the sides and roof were made of the “new” 3-ply wood center fiber board. 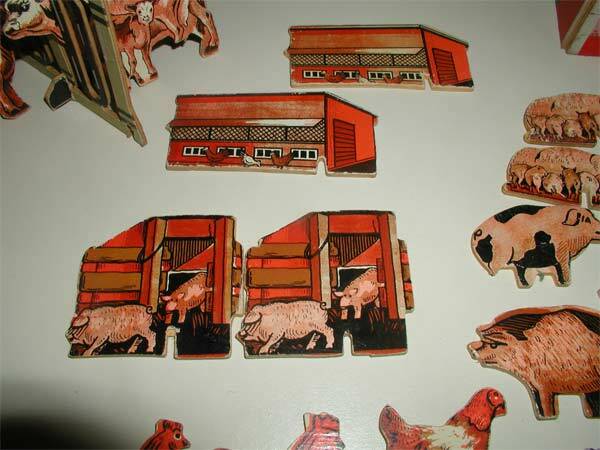 The set included 44 practically unbreakable 3-ply wood center people, animals and other familiar farm articles cut out true-to-shape. 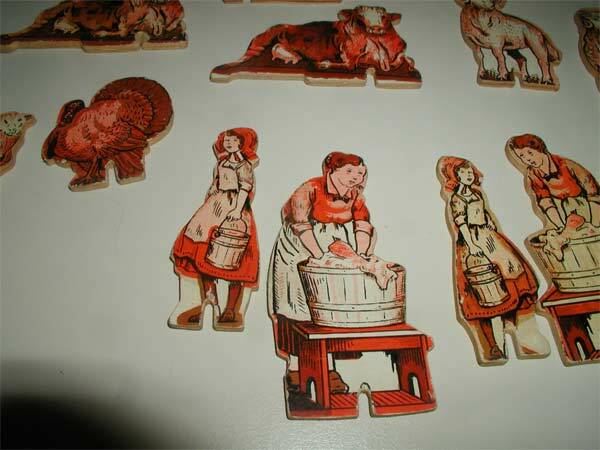 They are printed on both sides and all have stands. 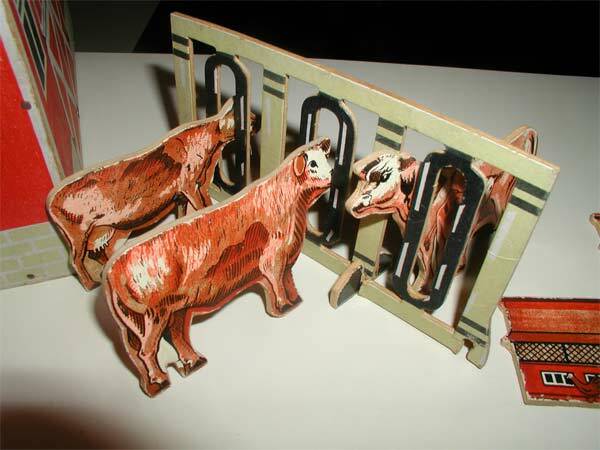 It has a 10-piece interlocking cardboard fence that was about 6-feet long. 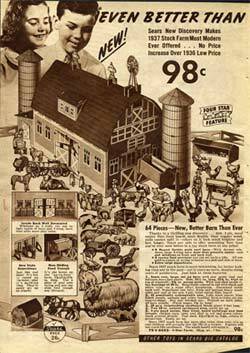 It came with two 10-inch colored silos and a feed trough. 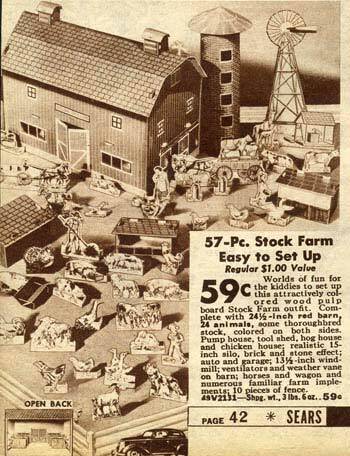 The set includes a chicken coop, open tool shed, and others. The figures do not crack like cardboard. 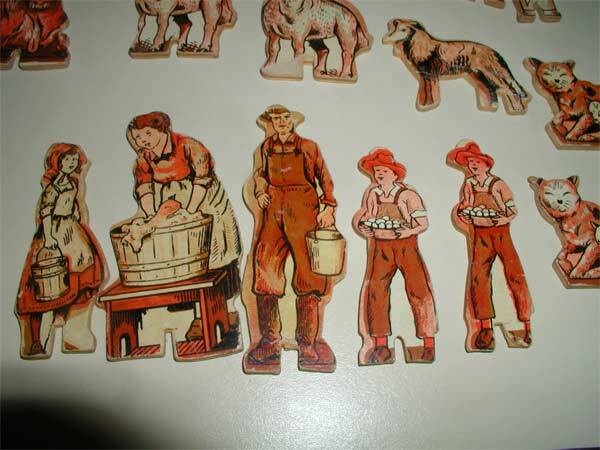 This farm set cost 98 cents in 1937. It now sells on eBay for about $100.